It was a good 20 years since I was last in Derry. I can’t really explain why it has taken me so long to go back to the city – after all, I’ve been in Donegal nearly every summer over the last few years and Derry is just a few miles up the road – but it’s been a long time and a visit was long overdue. Back when I was last hanging out in the city, hitting raves and checking out bands in the early Nineties, it was a buzzy, vibrant, proud place. Last weekend, as the Other Voices’ roadshow brought bands (and Banter) to the city, you still found a buzzy, vibrant, proud place, albeit one slowly getting into the City of Culture groove and working out what this meant in the short, medium and long run. There was one word I heard again and again over the weekend and that was legacy. You’re never far from history here, from the walls to the Bogside, so legacy is something which is in the water in a city which sports so many scars and bruises. This time, the legacy had to do with what the City of Culture designation leaves behind. There’s talk about the lack of buildings and spaces, the need for more physical infrastructure in a city, which people keep reminding you, has never known real prosperity. Yet there’s also another sort of legacy and it’s a lot harder to pin down because it’s more nebulous than a building or a square. This legacy has to do with mindset and how you realise that everything you need to change things is already out there in front of you. It’s about realising that you don’t need a cool title to make you a cool city. We held two Derry-centric panels at the Banter Salon and I also chaired the first Civic Conversation at the Void Gallery to try to tease out from local arts and culture practitioners what they wanted or could get from the City of Culture shenanigans. There was, as you’d expect, a bit of whinging and cribbing at the latter about who got what and who didn’t get what from the City of Culture coffers and how it ignored or blanked certain areas and communities in the city. But once you persisted with the questions, ideas began to emerge about positivies and possibilities to be drawn from the current spell of attention. There were also political arguments about the very notion of engagement with the City of Culture project, but even the naysayers had to admit that this conversation probably would not be happening with the same vigour or enthusiasm were it not for 2013 and all that. After all, there wouldn’t be a City of Counterculture project without the existence of a City of Culture project to begin with. But it’s what happens after the City of Culture bandwagon moves on that’s the most important aspect to consider. A couple of times over the weekend at various panels, I asked people to give a few reasons why people should move to Derry. We got a variety of answers but naturally, no-one mentioned the City of Culture stuff because this is a temporary glittering series of balls and carnivals. 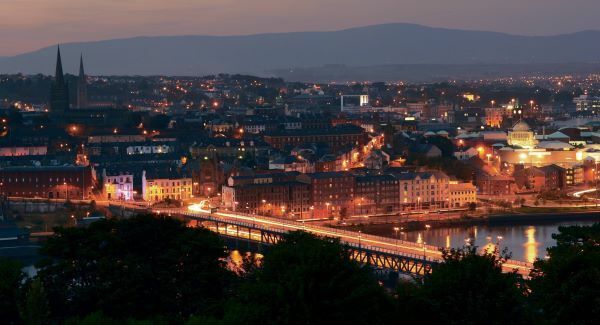 It shines a light on the city and brings in people – I met people over the weekend who’d come to the city from Cork, Belfast and Dublin on the back of Other Voices to check out Derry – but it’s not the be-all and end-all because 2014 is only 10 months away and life will have to go on. While the City of Culture thing gives Derry a chance to attract all this attention and make the most of it, the real worth for the city in the long run is in what’s already here: the people, the projects, the culture, the history and the possibilities for a city full of civic pride in taking bold steps. True, it’s a whole lot harder to tease these things out than apply for a grant or funding to some organisation. True, the need for financing has to be addressed and this is hard to come by in Derry (and, in fairness, everywhere else) right now. And true, the dialogue about jobs and making a living will always come to the fore quite quickly in these conversations (it certainly did last weekend). But the need to address these issues from the get-go may well be acting as a brake on possible ideas and scenarios which could well sort out those issues later on. Because right now, Derry has so many possibilities. Over the weekend, it was Derry acts like Little Bear, Bronagh Gallagher and Soak (Bridie was everywhere over the last few days, even saving the Banter bacon by sitting in for an unplanned interview when Bronagh Gallagher was running late) who had people talking. Other local acts like Ryan Vail and Rosie Carney also impressed me hugely with their performances. Sure, there was also great music and art from elsewhere to entertain you – Savages were quite immense in the most searing, intense and emotional way on Friday night at the Glassworks, while Candice Breitz’s fantastic Him + Her video installation at the Void, featuring Jack Nicholson and Meryl Streep, is worth going to see a few times – but it was the homegrown fare which really tantalised your tastebuds. Even if it will be the outside spectacles that will get the big wows and all the oxegen of publicity, Derry already has the goods in spades. It just needs to realise they’re there and how best to big them up. There will be plenty of other opportunities to head to the north-west this year – I’m looking forward to the return of CultureTECH in September and the arrival of the Turner Prize in the city – but it will be interesting to watch how this blast of attention will colour the city’s cultural outlook in the future. Derry will still be around in ’14 and ’15 and it’s then that you’ll begin to see just how much this year’s fandango has worked its way into the fabric.